Simple design with some fancy details like the recesses for the box and the oil can. Finished with shellac, maybe not the strongest protection but I don’t mind if it wears, it’s only a workshop furniture after all. Nice job on the cabinet. The recesses are a good idea. You should detail how you made the drawers, they look interesting. Nice, clean design. 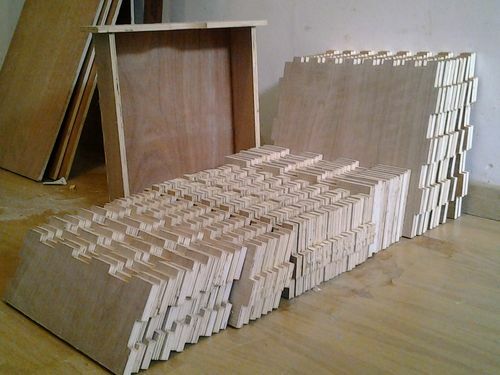 I’m getting ready to replace some cheap Ikea cabinets with something like this. You’ve given me some good ideas. Did you do the steel work yourself? Like the recessed idea … was thinking of something similar for sharpening stones. Nice build! Good design and a nice build too. Very elegant metal/wood combination. That’s quite a bunch of material. At least from this distance, the metalwork looks good to me! I like the open design to show off the mixed media. Fabulous design with lots of storage. The is the advantage of a good quality bench top drill press. It’s harder to do this with a floor model. 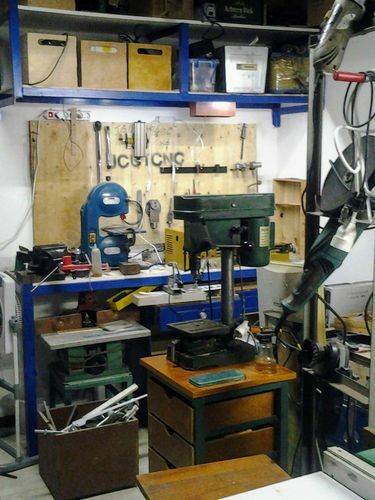 This is a very nice drill press base and has a lot of great storage room. It will be a great addition to the shop. Tell us more about this CNC machine. It’s a basic kit made out of wood with drawer slides as guides, a totally outdated machine but surprisingly very capable and quite accurate. Nice work, a well built and creative design! I forgot to add the pic of the stand in the workshop.